I know that I have been picking up so many of these types of books lately. Music, which is one of my only other escapes besides books, and contemporary romance, my favourite genre, both tied into one book with the love interest as a pop star is seriously the best. Also, how could you pass up on reading this book after eyeing that gorgeous cover? I know I certainly couldn’t have. I think you’ll be able to guess that hence my trend of loving these books, When It’s Real just joined the list. I have read many books like this before, but I know I’ll for sure remember this one over some of the others. This novel basically follows the dual perspectives of teens Oakley (male) and Vaughn (female). Oakley is a pop star whose team simply wants him to be seen in a different light, so they try to help him with that, hiring Vaughn to be a fake girlfriend of his to gain attention. Vaughn is perfectly happy with her own boyfriend and knows that this is merely a scheme for Oakley to be noticed, and she dislikes him when they first meet. Soon enough, though, she realizes that she’s falling for the both of them. Although I felt very sorry for her, Vaughn’s backstory isn’t unheard of in YA fiction. She’s lost both of her parents and her sister is the only family member she still has. Pushing that aside, I still saw her as a fantastic character whom readers will be able to look up to and adore. Now it’s Oakley’s turn to be judged! He may have been a popular teen heartthrob, but I found him to be quite humble for what he had going for him- unlike many celebrities who drink regularly and often get arrested, in my opinion he wasn’t the least bit full of himself, and I admired that. 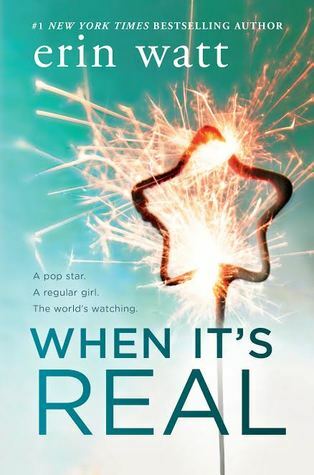 Overall, I have to say that I was a big fan of When It’s Real. I’d definitely consider reading some more about the well-crafted characters and simply just having this storyline make me feel gregarious again. Those who enjoy reading about set up relationships, heartthrob pop stars, and enemies turned into lovers would adore this read for sure! I liked this book too! It was super cute ❤ I do agree that some of the filler scenes were pointless lol. I did like the dual POV though and I loved what a page turner it was.